This blog describe a weekend break (sans John) based in the beautiful, historic Fife town of St Andrews. 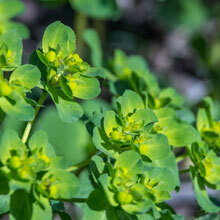 It was blessed with plenty of bright weather, although it was quite cold and windy at times. 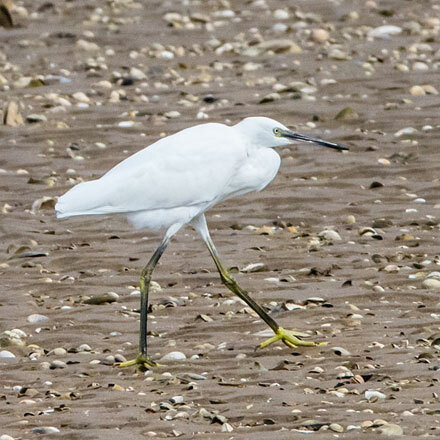 On Friday morning I enjoyed a stroll along the West Sands beach, but it was disappointing in that the tide was very low and the few birds I could see were very distant and every other walker had a dog. 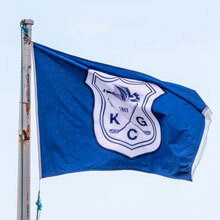 The return journey was along the West Sands Road that runs parallel to the Jubilee golf course. I was pleased to find a few photo-opportunities there, starting with a handsome Stonechat standing proudly in the bright Autumn sunshine. 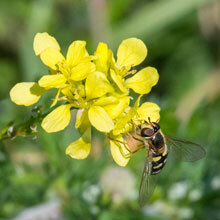 I snapped the hoverfly, Syrphus Ribesii as it supped the nectar of flowers of Hedge Mustard. 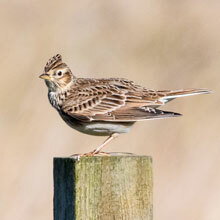 Next I was initially startled by a pair of Skylarks that seemed to be indulging in a bit of late season courting. Once they had settled, I was able to get some satisfying shots. 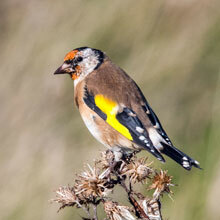 There were also some very mobile and noisy Goldfinches in the bushes along the course. 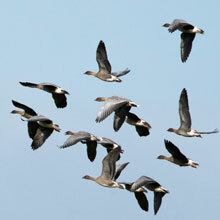 Their plumages were not at their best, probably as they were moulting. 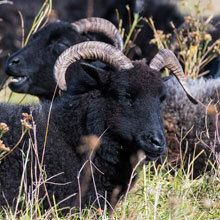 In one fenced-off area between the road and the sand dunes and beach, next to the 9th and 10th holes of the Jubilee Course, there were a dozen or so grazing Hebridean Sheep As I attempted to get that definitive sheep shot, a Small White butterfly fluttered past and also settled on the yellow Hedge Mustard flowers. 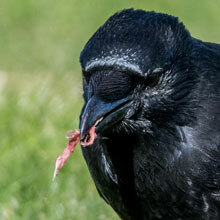 Nearby, a Starling was calling from the top of a fence post and below it a Carrion Crow was nibbling on, well, carrion, probably a big worm. 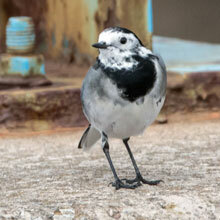 At the car a White Wagtail and a Black-headed Gull were hanging about waiting for some scraps of food from the many parked cars. But that was all I saw in my short walk. 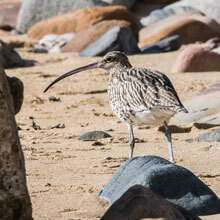 However, later in the day I had a stroll around the harbour area and East Sands beach. 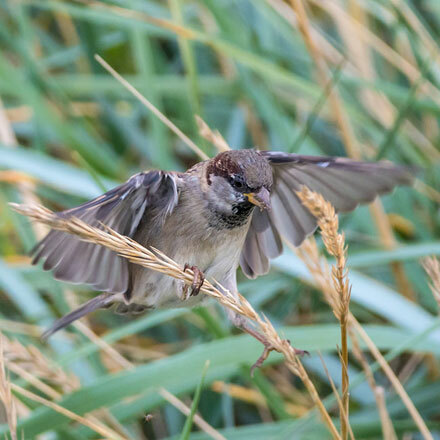 Lively House Sparrows were frolicking in the long grass, as, offshore, I spotted that a Cormorant had caught a fish, probably a Rockling. My next sighting was rather weird. I heard a man shouting followed by the sight of a barefooted bride running along the top of the harbour wall. Then I noticed that the man who had been shouting was operating a drone. I can only guess that I had been watching him using the drone to take aerial pictures of the bride. 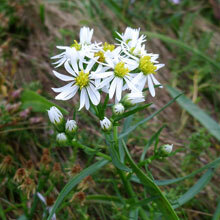 At several places along the harbour there were violet and yellow Seaside Daisies, a naturalised plant, originating from North American coasts. 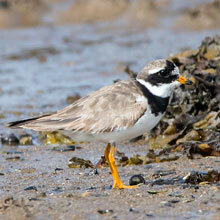 Along the breakwater there were several Ringed Plovers, which may have been a family of 2 adults with 4 or 5 juveniles. 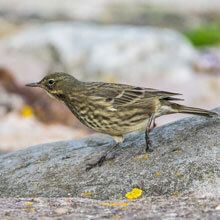 My last sighting was of a very familiar bird, a Rock Pipit, as it meandered and pecked its way along the harbour road. 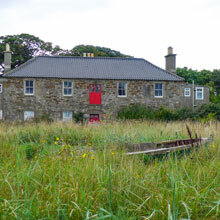 The following day I found myself exploring the ancient coastal town of Crail. I walked along the part of the Fife Coastal Path that passes along the south of the town. 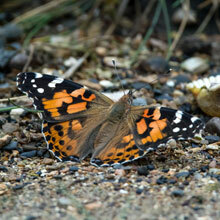 My first capture was of a beautiful Painted Lady butterfly as it sheltered from the stiff breeze. 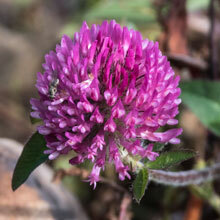 Along the sides of the path I spotted several pretty wildflowers. 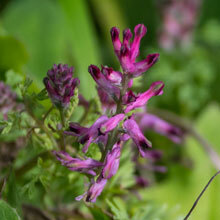 First of these were Sun Surge and Common Fumitory. 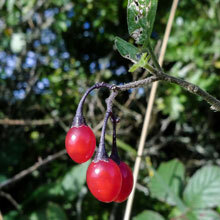 The latter has been used in the past to treat conjunctivitis and skin diseases, and also to cleanse the kidneys, although we now know it is actually poisonous -so don’t try it! 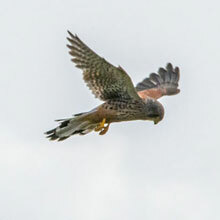 A Kestrel paid me a visit as I photographed the flowers. It hovered several times as it passed, allowing my the opportunity to get some pictures. 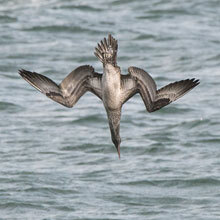 Every 5 minutes, 2 or 3 Gannets swept by. The Bass Rock, home to hundreds of Gannets, is on the other side of the Firth of Forth, a short trip for such powerful birds. 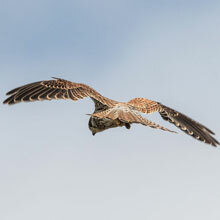 The picture below is of a first cycle juvenile, one of the many I saw, each earning its wings just as its first summer has come to an end. 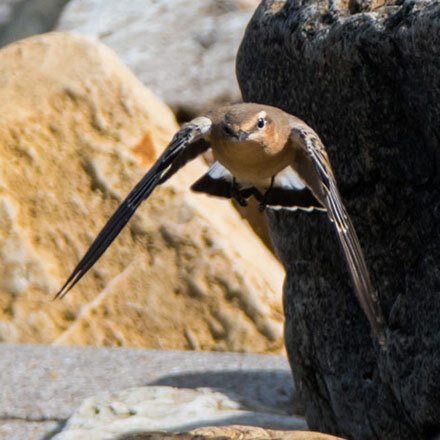 I was being carefully watched from the Rocky shore by a Wheater that will soon be flying south to winter in Central Africa. 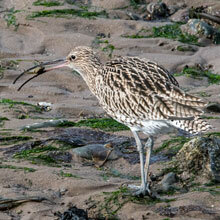 Also cautiously tracking me was a Curlew. 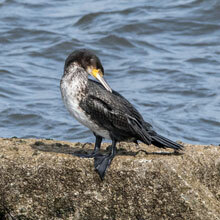 As I moved slowly along the shore it kept a safe distance between us. 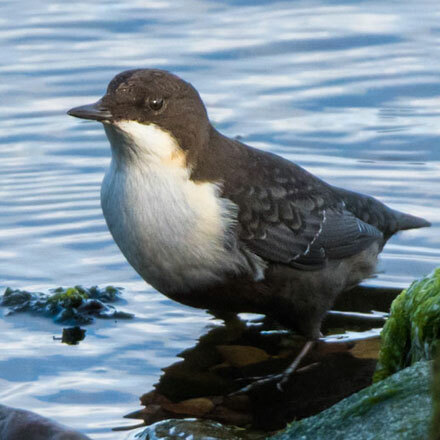 Just before I left the path I came across a wee Dipper hiding behind large rocks at the mouth of a burn (See “Pictures of the Week”, below). 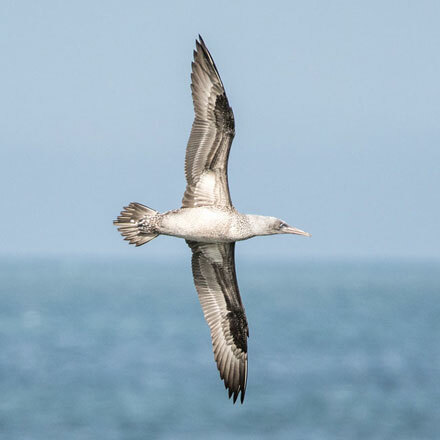 The dipping and bobbing movements, from which it gets its name, make it easier to spot - and a large focal length lens also helps! 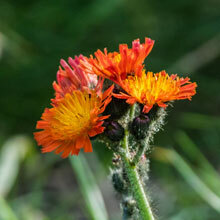 The final shot was of an eye-catching flower, Fox and Cubs. 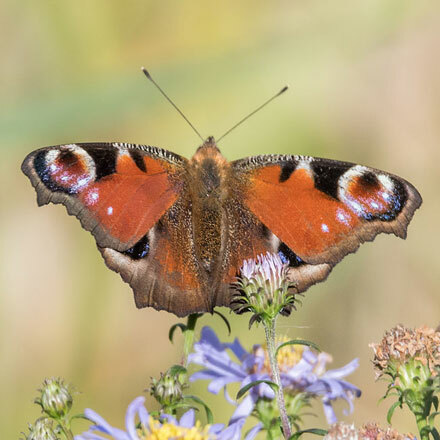 It’s not a plant you’d want in your garden though, as once established, is very difficult to prevent it from spreading across the whole garden. 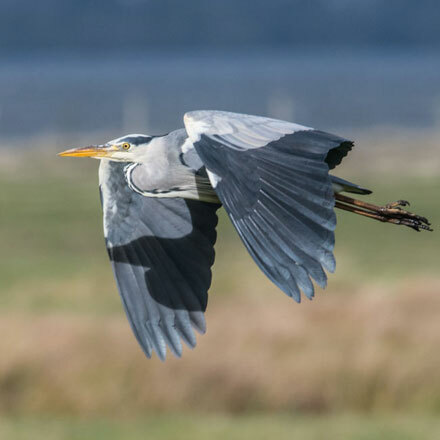 … a Grey Heron flew across the front of the hide. 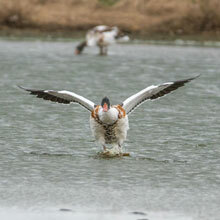 And still the Geese poured in and landed about 300m away from the hide. 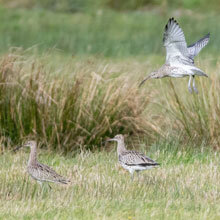 As I watched them I noticed a few agitated Curlews only 50m from the hide. 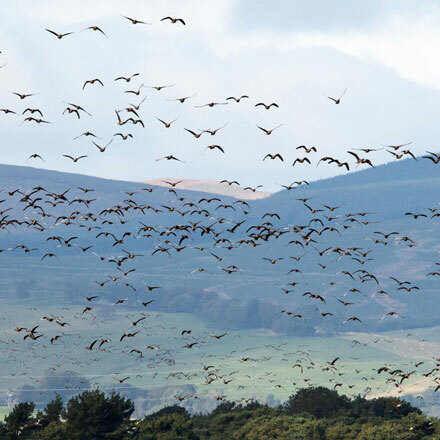 Maybe the geese unsettled them. After 30 minutes I left more satisfied than I had been earlier. 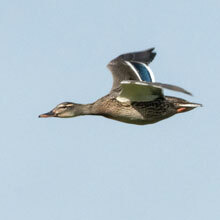 A flying female Mallard signalled the end of my quick visit. My brief but very enjoyable visit to Fife was rounded off with a cup of tea and a fruit scone served up in the very welcoming Reserve cafe. 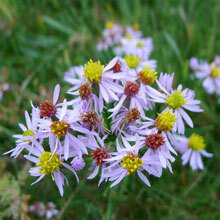 Along the verges of the path, several patches of the beautiful violet and yellow Michaelmas Daisies stood above the long grass. 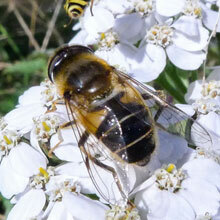 I stood over one such plant with my trusty LUMIX LX5 (which I use for macros) and had soon photographed a trio of different species of hoverfly: the aptly named Common Banded Hoverfly, syrphus_ribesii, The Footballer (due to its vertical stripes being like a football strip) helophilus_pendulus (Greek for"dangling marsh-lover") and the less attractive, bee-like, eristalis_arbustorum. 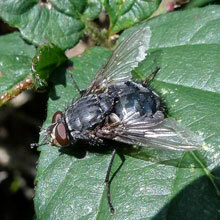 Close by on a Bramble leaf, I caught picture of the Bluebottle, calliphora_vicina, now, late in the season, more grey than blue. We had gathered all of those sightings and we hadn’t even reached the reservoir, but when we did our hearts fell a bit as it had very little water in it. 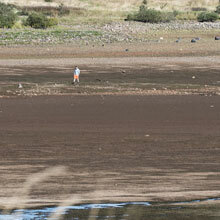 A few people were out in the middle of the reservoir basin digging for something or other. 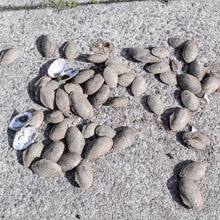 We found out what that was as we reached a concrete quay upon which were a load of freshwater Swan Mussels. 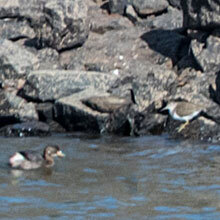 As we scanned the basin we could see birds, but they were over 100m away. 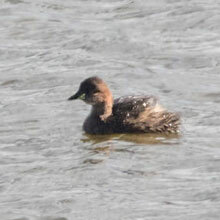 A Little Grebe swam to the edge of a pool, still 50 m away. 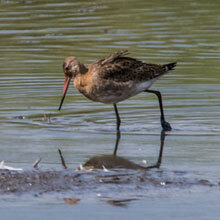 However as we moved along the south side of the reservoir we came upon a pair of relatively close Bar-tailed Godwits probing the shallows for invertebrates. 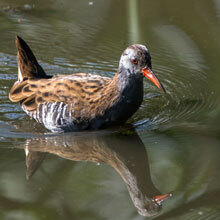 No Phalaropes though. 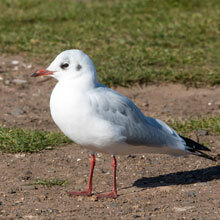 We pressed on past a dabbling female Teal and cautious Black-headed Gull. 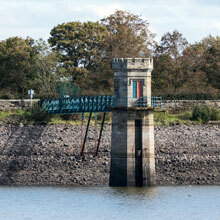 Across the basin, the causeway and tower were fully exposed by the lack of water. John is due an apology as I thought he was seeing things when he maintained that a bird flapping its wings had been sitting near the base of the tower, not far from a Little Grebe. 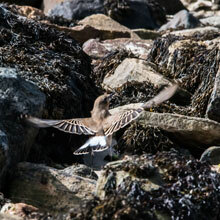 I thought it was waves lapping over a rock, but inspection of the photos later clearly showed that there was a bird, probably a Common Sandpiper, tucked between the chunky boulders. 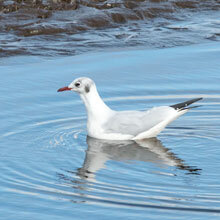 At the south end of the reservoir, where the Phalarope had been seen, it was clear “the bird had flown”. 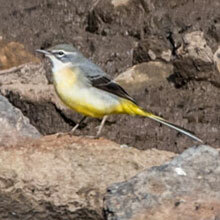 Still, we did see nice but less rare birds such as Teal, Tufted Ducks, Meadow Pipits and, one of my favourites, a Grey Wagtail. A Great Crested Grebe got within camera range and we had a fly past of Lapwings that had been resting in a neighbouring field before being spooked by some unseen hazard. We headed back up the path, determined to make the most of our time there. A Peacock butterfly fluttered past our heads onto some Michaelmas Daisies, and then, out of nowhere, a Kestrel appeared hovering some 10m above us, so close I had to zoom-in my lens. 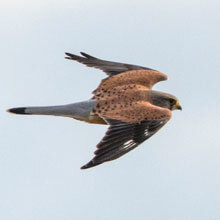 It was a pity the Kestrel was facing the wrong way! 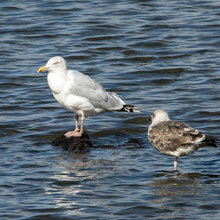 The most common birds we saw were probably Herring Gulls. Maybe they were picking off any invertebrates or even fish, frogs and newts exposed by the low water level. 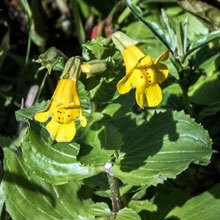 As we walked across a footbridge I noticed a Monkey Flower flourishing at the edges of the stream below. 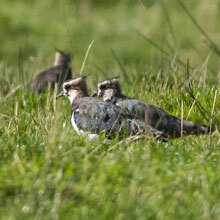 In a field near the car park we relocated the Lapwings we had seen earlier. 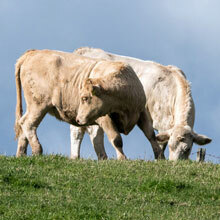 They seemed calm enough lodging with the cattle. 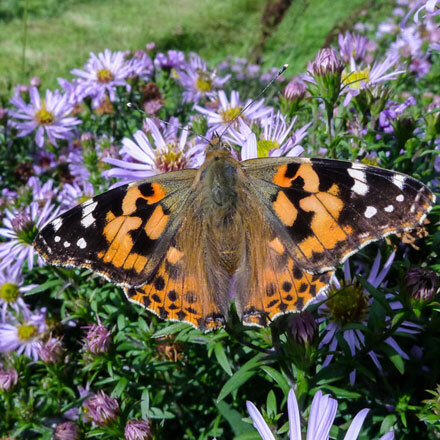 In the last 50m of our walk I managed to creep up on an exquisite Painted Lady butterfly as it fed on, you’ve guessed it, Michaelmas Daisies. 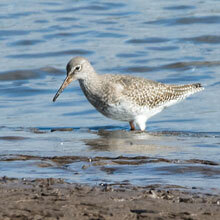 Out in the muddy basin I noticed small waders scurrying around. 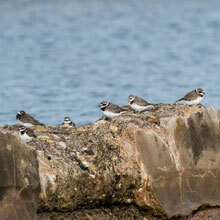 They were Ringed Plover and Dunlin. 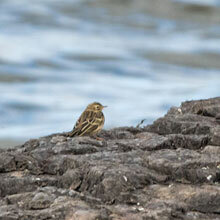 As they were quite far out, my shots were, as they say on social media in such circumstances, merely record shots. 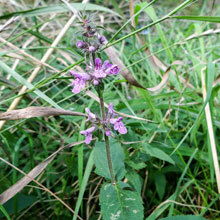 Our final two flowers of the day were of a Marsh Woundwort hiding in the long grass, and the eye catching Red Clover on the banks of the Reservoir. 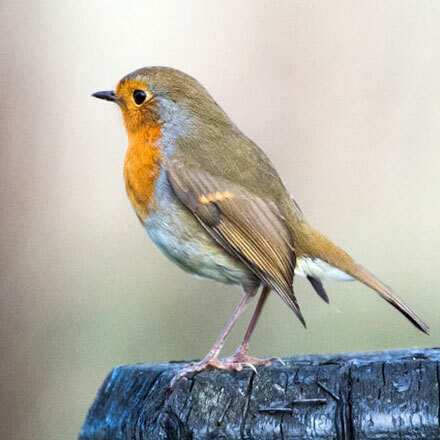 Our final two birds of the visit were probably my favourite shots - a cheeky wee Robin checking us out as it sat on a black post, and a female Reed Bunting that John spotted as I was reversing out of the car park. Because I was driving, I passed the camera to John who expertly executed the shot. (see “Pictures of the Week”, below). As per usual we finished the day with a cup of strong tea, this time accompanied by the same delicacy as last week, lemon cream muffin. We agreed that it had been a pleasant trip with lots to interest us. 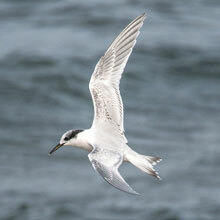 It was just a pity we dipped out on the Grey Phalarope. 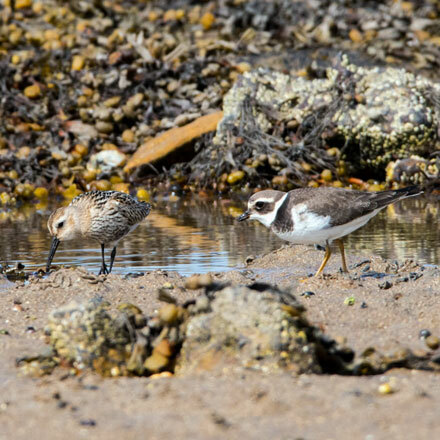 We chose to travel east to Musselburgh this week as I’d read reports that some interesting birds had been seen there, namely the White-winged Scoter, Red-necked Grebe and Pectoral Sandpiper. 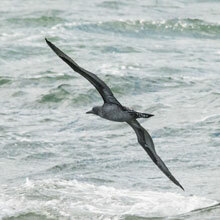 However, the elements were against us as rain and high winds were predicted. 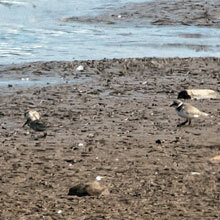 Also, the tide was low at the time of our visit so the first two birds would be quite far from the sea wall. 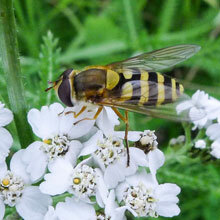 As we got out of the car, parked on the approach road at Levenhall Links Leisure Park, we were already up and running, as I spotted a hoverfly, the Humming Syrphus (Syrphus ribesii) on a Yarrow flower head. We then made the short walk down to the sea wall where a nice pair of cyclists directed us to where they had seen seals on the shore. 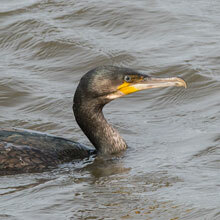 However we arrived just as the seals disappeared into the sea past a Cormorant preening on a waste pipe. 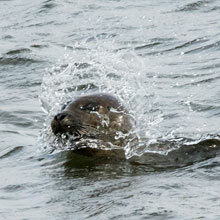 But in a few minutes we realised that they were actually pretty active, and surfaced often as they moved across the bay. 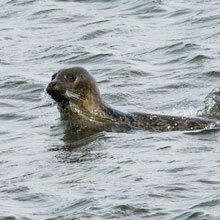 We counted at least 5 Common Seals, a few of which, we were told by a local, were juveniles. 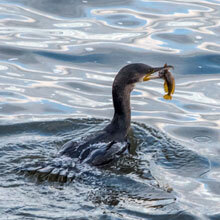 After about 20 minutes I had managed quite a few shots of their antics. As we studied the seals, we could see, just to the east, four Sandwich Terns fishing, so we moved there to try for some pictures. As usually happens though, when we got there they had moved on. 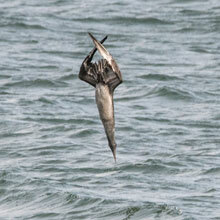 It wasn’t all bad, a pair of first cycle Gannets turned up and proceeded to fish quite close to the wall. They made repeated low dives, mostly unsuccessful ones, but I dare say they were honing their natural skills up to the level of their more impressive adults (We later learned that there was a “feeding frenzy” of many tens of Gannets much further up the coast, at Skateraw, to the East of their nesting area, the Bass Rock). And then the Sandwich Terns returned, a mixture of adults and juveniles displaying acrobatic skills as the made repeated dives into the sea. After feasting for about half an hour on the diving birds we moved into the Scrapes, otherwise known as the Levenhall Links Bird Reserve. 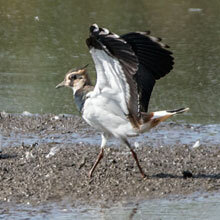 The light was poor but straight away, from the middle hide, I snapped a Shelduck as it flew between lagoons. 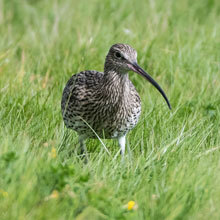 On the grass, a pair of Curlew were searching for invertebrates. 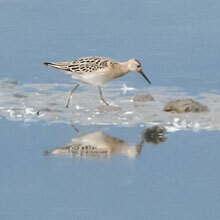 From the left hide, during a brief sunny interlude, I caught a female Ruff as it moved across the shallow waters. Then, just as the rain began again, I caught a distant view of one of our “target” birds, the juvenile Pectoral Sandpiper. 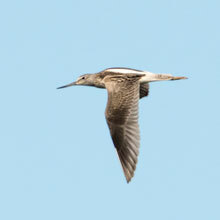 Just a bit bigger than a Dunlin, it is identifiable by a faint, broad white band above its eye, ochre legs and a pair of white lines along its shoulders. 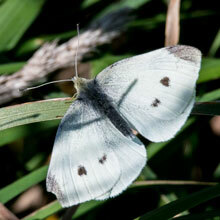 Its boldly streaked breast and white belly form a sharp border. Fairly pleased and slightly damp, we moved back down to the sea wall to see if we could make out the American White-winged Scoter within the flock of regular Velvet Scoters. 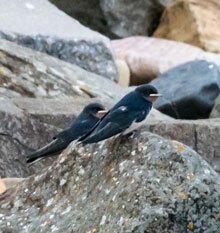 Initially we could not as they were too far out and the light was pretty gloomy. 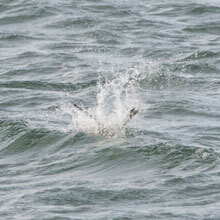 We did though get a visit from a Guillemot that popped up in the sea just below the sea wall. 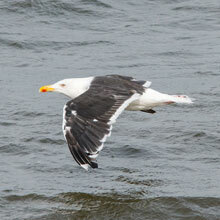 A Great Black-backed Gull cruised past, and then a Cormorant surfaced just in front of us. 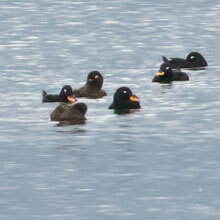 The light improved and the Scoters, about 40 of them, got a bit closer but we couldn’t see the one we were after. On inspecting the pictures later that night I saw a few that might have shown it, but I remain unconvinced. 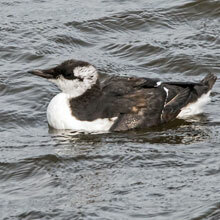 Common Guillimot Great Blacked-backed Gull Cormorant Common Scoter? As we struggled back to the car to drive to the Esk mouth, we were startled by a Pheasant that flew over the Scrapes fence, itself obviously startled by something. 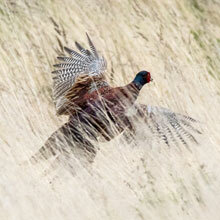 I managed a couple of shots before it disappeared into the long grass. 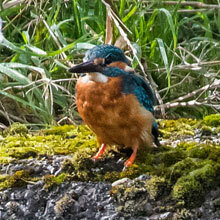 At the Esk we parked next to the Cadet Hall and looked upstream for signs of a reported Kingfisher. 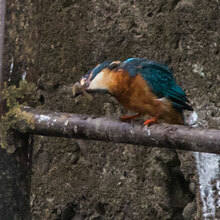 Sure enough, John spotted it taking a fish from the water up to a rung of a ladder on the riverbank. 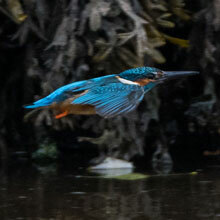 We watched it for about a quarter of an hour during which time I got some nice shots, some as it flew along the bank. Our final foray at Musselburgh was a quick look at the mouth of the river. 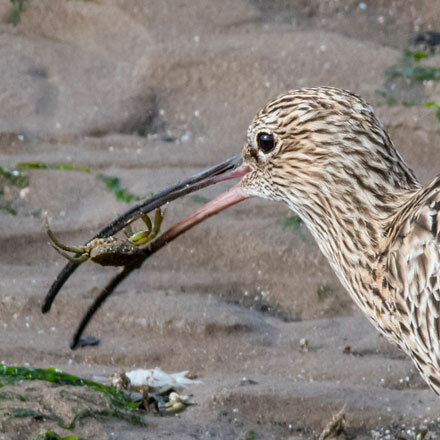 Of course, there were the ever-present Oystercatchers and Curlew, but I love to watch them and I’m always looking for interesting shots like the Curlew dispatching a couple of small Crabs (see below and Pictures of the Week). 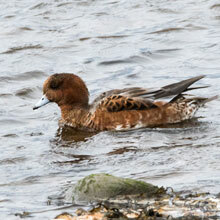 On our way back to the car John pointed out our first sighting for a few months of a Wigeon as it dabbled along the river shallows. 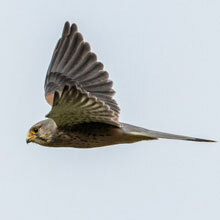 It was John again who noticed a Kestrel hunting in its unique hovering style along the banks of the estuary hinterland. 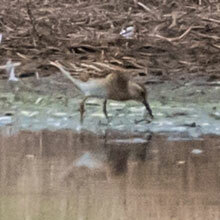 It was a pity the light was very poor, but the photo below shows the bird in action. 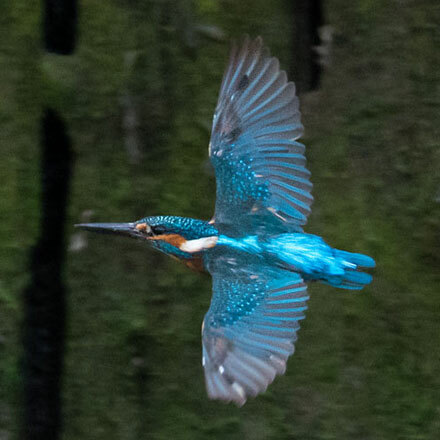 We got our tea and lemon cream muffins from the car and sat at the side of the Esk eating, drinking and watching for any further action from the Kingfisher. 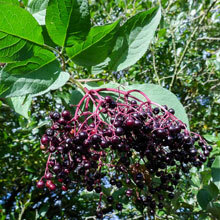 No such luck, but it didn’t matter as we were happy enough with our haul of pictures. 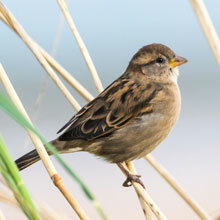 Still, I might return soon to catch up with the birds we missed. This is a record of a couple of fairly brief visits to my local reserve at RSPB Baron’s Haugh, Motherwell. Poor John was working so I was on my own. 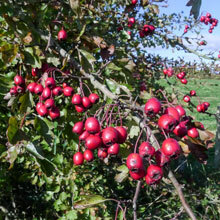 The weather both days was very bright and mild, ideal for photographing nature. 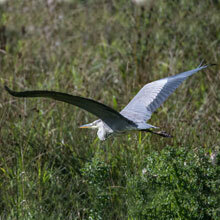 It was a quiet walk from the car to the reserve hides. There was hardly a twitter, not even a crow or pigeon. 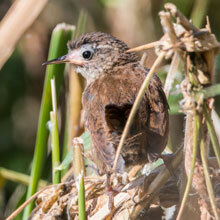 However when I arrived at the Causeway Hide, birders there drew my attention to a Water Rail that was lurking in the reeds just below the hide. 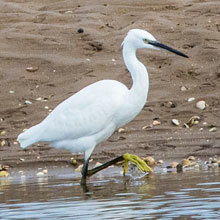 Before long it emerged into the pools and we all had great opportunities for shots before it scampered back into the reedbed. As I waited for it to re-emerge, I noticed the foliage close to the hide was moving erratically as if something was rummaging below. 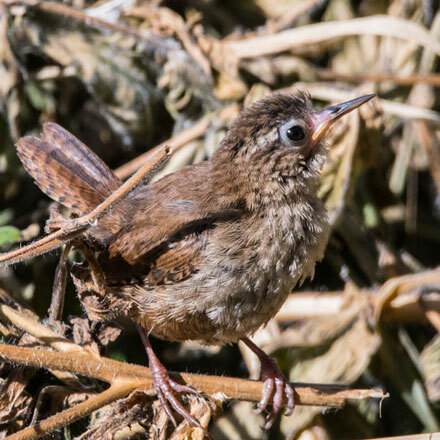 Then suddenly, it became apparent that it was a fledgling Wren climbing up the vegetation. 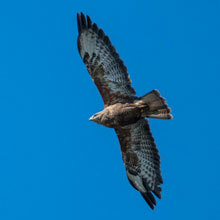 It was lucky there wasn’t a Sparrowhawk about as it looked very weak and vulnerable. Out on the Haugh, as well as the usual Mallards, I could see a few Black-tailed Godwits, some resting, some preening and others feeding. 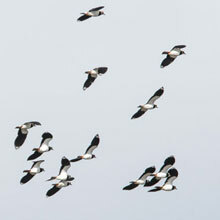 There was a large flock of Lapwings on the opposite side, but the occasional individual checked out the end I was on. 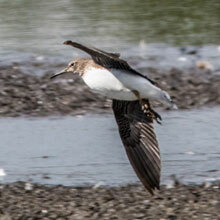 A wee Green Sandpiper also flew past the hide, but didn’t fancy it and kept flying before settling on a sandy bank some 60 m away. 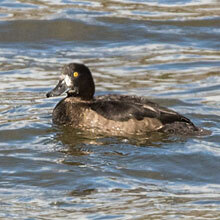 That was one of about a dozen that had been seen there in the previous few weeks. And with the beeping of a text message from the wife, that was that for my Tuesday visit. 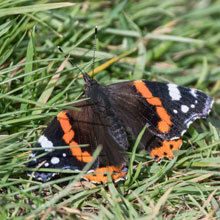 My Thursday walk down to the Causeway Hide was a only a bit more productive. 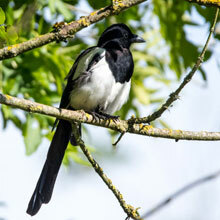 A well-lit Magpie sat on a treetop calling to others on trees further down. 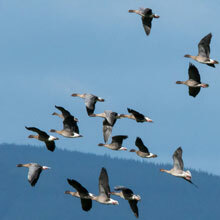 It was a bit more vacant Haugh when I arrived at the hide than from the Tuesday. 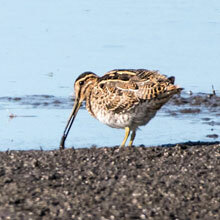 Some Snipe gathered around an exposed tree stump was the only sighting close enough for decent shot, but further away I also spotted Curlew, Little Grebes, Green Sandpipers, Cormorants, Grey Heron and, of course, Mallards. 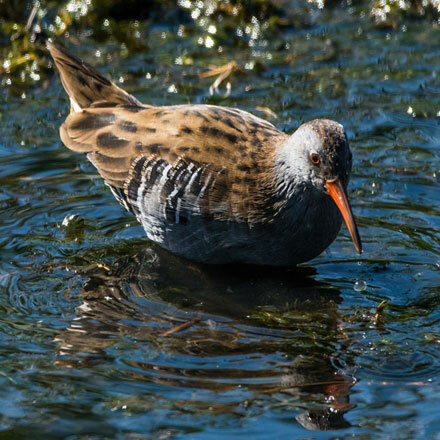 I decided to go for a walk around the reserve to see if I could see anything on the River Clyde, and to heat myself up as there was a steady, chilling breeze blowing through the hide. As I sat on a bench by a bend on the River Clyde where Otters frequently turn up, I was startled by a lone Bar-tailed Godwit darting fairly erratically over the River. I wondered where its mates were. I must have missed them. 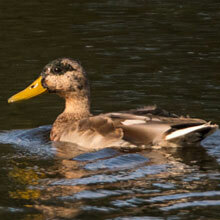 Next I thought I saw a Mallard paddling close by on the Clyde, but on noticing it’s long bill I think it is a hybrid, possibly with some Shoveler in it. 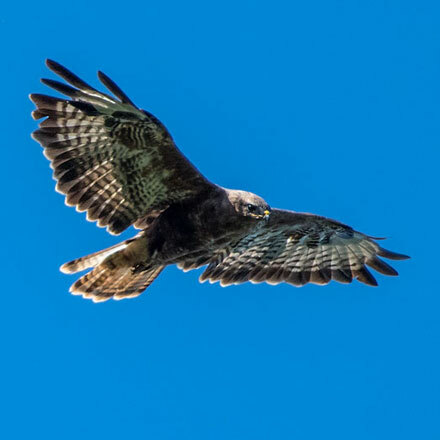 Then, slightly disappointed that the Otter didn’t turn up, I stood up to move on, only to stop when I heard a calling Buzzard circling directly overhead. 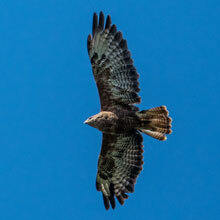 I got some excellent shots of the back-lit bird against the azure sky. 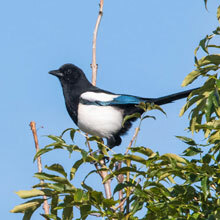 On my way back to the Causeway Hide I came upon another Magpie, this time it was much closer sitting on branches overlooking a field. 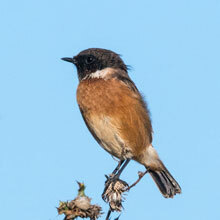 I returned satisfied to the Causeway Hide and then got a few more pleasing shots. 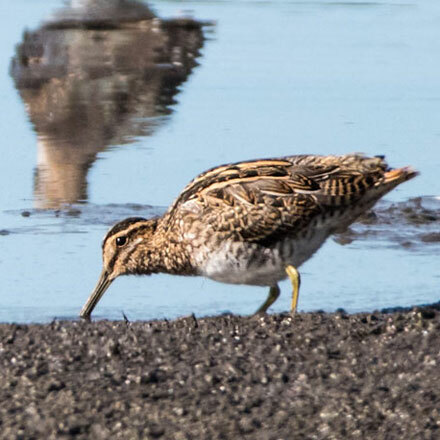 First was of Snipe that were happily prodding the shallows for invertebrates, but were spooked by something or other, probably a passing raptor. 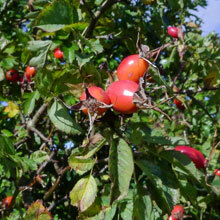 They fled southwards to find safety. 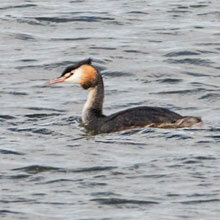 In the middle of the Haugh, I could hear the persistent calls of a Great Crested Grebe chick. 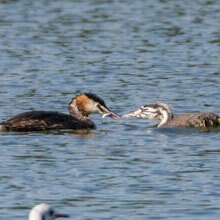 One of its parents surfaced with a fish in its beak, paddled towards the chick, who was delighted to receive it. 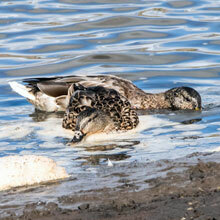 A birder later informed me that there were two chicks and that each was being fed by one of its parents. 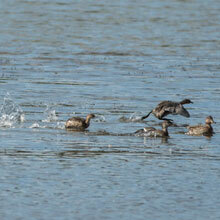 My last photo from the Causeway Hide was of a group of about six Little Grebes “charging” across the water surface, for what precise reason, I’m not sure. 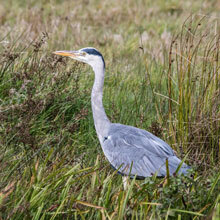 On my way back to my car, I popped into the Marsh Hide but all I observed was a passing Grey Heron. 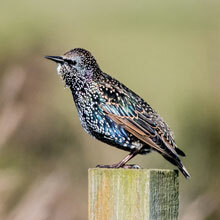 As can be seen from the pictures I’ve assembled, RSPB Baron’s Haugh is an excellent reserve for observing wildlife. Also it is worth noting, stating the obvious, that repeated short visits over a few days bring rewards. Finally, I’d like to say that walking a reserve is a therapeutic experience that dissolves away some of life’s worries (but only if you don’t run into one of the, sadly, increasing number of professional dog walkers whose antics tend to raise the blood pressure). The weather predictions for Sunday were directing us to the east. Rain was threatened in the west, while the east was to have been dry but, alas, overcast. 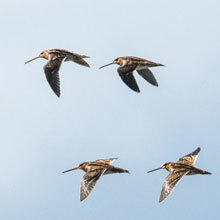 In Twitter feeds, birders had flagged up encouraging sightings around Aberlady LNR, including Little Egrets, Short-eared Owl, Black-tailed Godwits and Peregrine. So Aberlady it was. First stop was, of course, breakfast at Dalkeith Morrisons (9/10: -1 for John’s over-greasy eggs). 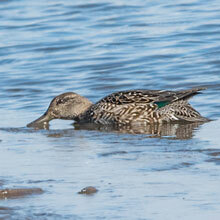 At Aberlady, the small LNR car park was full, but we managed to park a 1/2 mile back, at the edge of the town. 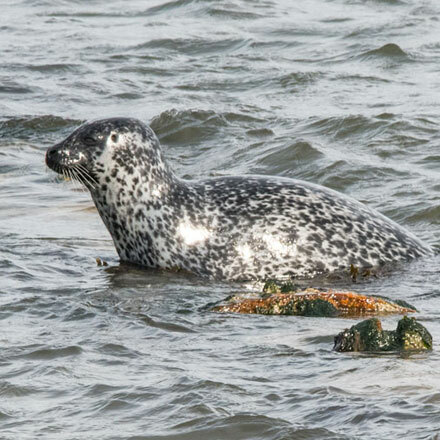 We decided instead to explore the shore to the north of the town beside the Kilspindie Golf Club. This was new ground for each of us. 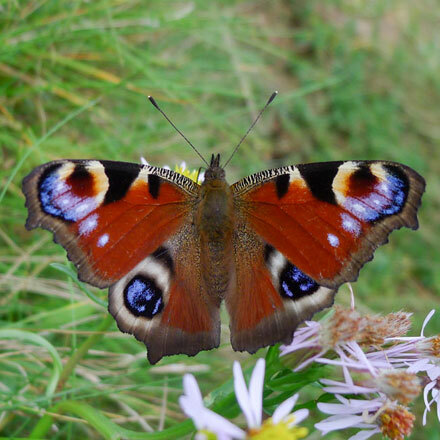 The light was very poor as we set off along the damp, marshy edges of the shore, but we immediately were greeted by a trio of beautiful butterflies. 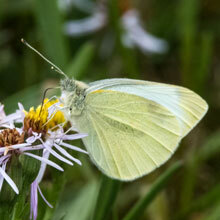 First a quite lively Small White settled on a flower of the plentiful violet-tinged Sea Aster. 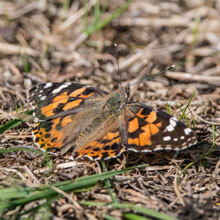 Next a few Painted Ladies appeared and eventually one rested on a wee sandy patch, giving me enough time to capture a few shots. 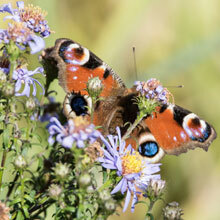 Much less flighty than these was a large Peacock butterfly. I was able to get quite a few nice macro shots on my trusty Panasonic Lumix LX5, although the light level was still depressingly dull. 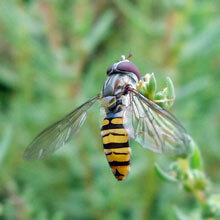 There were a few other insects frequenting the salt marsh. 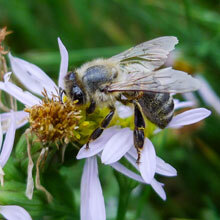 Honey Bees looked busy as they systematically moved from daisy to daisy. 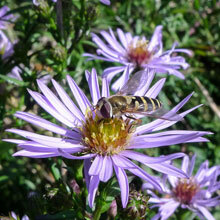 Also working the flowers were several species of hoverflies. 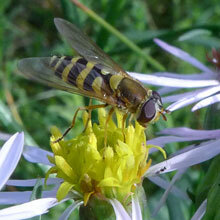 The Common Banded hoverfly, Syrphus Ribesii, was largest amongst these with prominent yellow and black banded abdomen and gold-topped thorax. 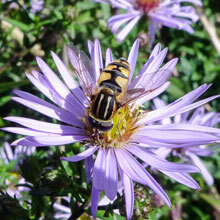 I must admit I’ve a soft spot for the UK’s most common hoverfly, the small Marmalade. 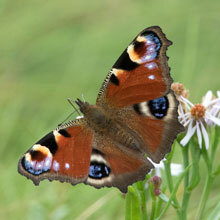 Its orange-tinged abdomen are marmalade-coloured - hence the name. Less attractive though was my next capture, a spider. 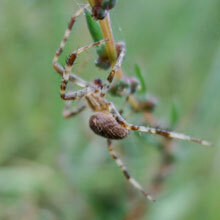 I’ve yet to firmly identify it, but it may be the Common Garden spider. 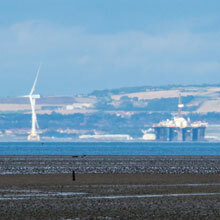 As we trudged on towards Aberlady Point we could see that the sun was shining on the Kingdom of Fife, Methil, to be specific, where a huge wind turbine is currently stationed . We hoped the sun would soon also bless us with its presence. 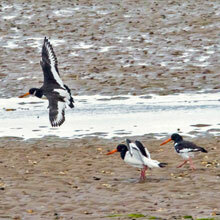 Some incoming Oystercatchers caught my attention just as we passed the Kilspindie Golf Club flag post. 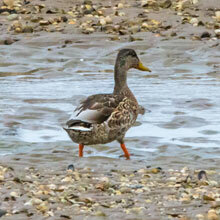 A Mallard retreated into the gloom, unimpressed by our attention. 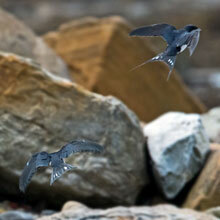 At the Point, at the edges of the shore, a pair of fledgling Swallows were being fed by a nervous parent. 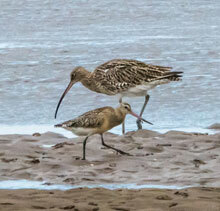 The young birds were perched on big rocks, waiting for the adult bird to return with insects.Nearer the sea, a Bar-tailed Godwit and a Curlew were passing each other without taking any notice of each other, probably because they don’t eat the same food. Then our prayers were answered - the sun came out from behind the clouds! 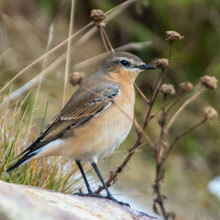 A female Wheatear whizzed passed away to the top of a rock. 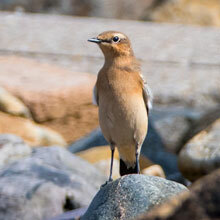 Notice, from the picture, it’s white rump, from which its name derives- “white erse” became “wheatear”. We then came upon an area of shore from which the sea had recently receded. 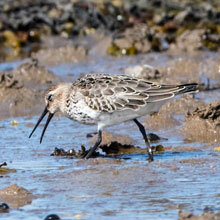 Foraging about the damp rocks and pools were Dunlins and Ringed Plovers. 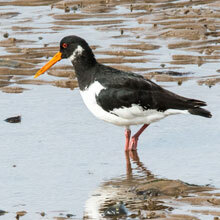 Their sunlit plumages were stunning. 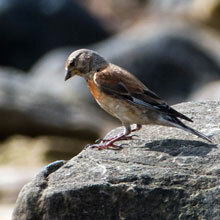 I planted myself behind a large rock just low enough to allow me to shoot pictures without distracting the birds. 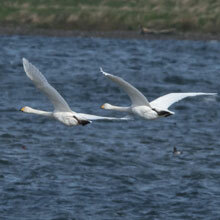 The sun was behind us - a good tip for new birders. If you stay still with sun behind, preferably seated, the birds see you in silhouette and don’t recognise you as being human. 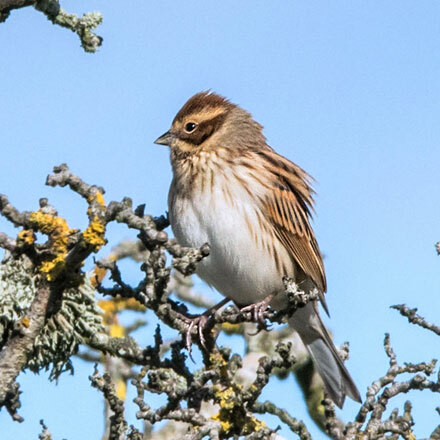 As if to prove this, a male Linnet flew over the Ringed Plover and straight towards us, and seeing us at the last second, landed on a rock to our right. 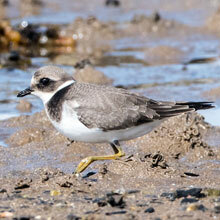 I then took a few shots of a lovely grey and white juvenile Ringed Plover. 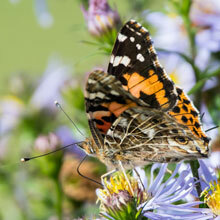 It’s a fact that most juveniles don’t survive past their 1st year, but those that do may live up to 10 years. 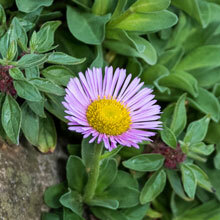 I noticed a white Sea Aster amid the usual violet ones. We moved off the shore onto the road into the golf club. We were watched by a bird on a wire. 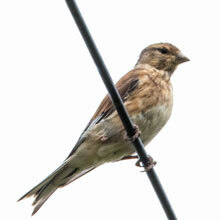 At first I thought it was a Sparrow, but I think it looks like a sick Linnet. 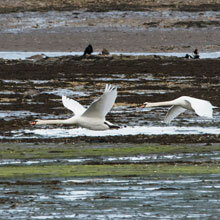 A pair of Mute Swans powered along the sands just as we reached the car. 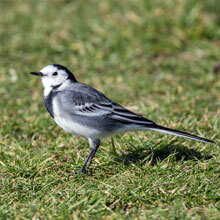 We moved west to Port Seton where we were met by a Pied Wagtail. But that was it for the day. Our trip was an exercise in positive thinking. Things turned out much better than I first thought they might. 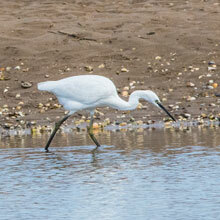 Main highlight of the day, that had many highlights, was the Little Egret. We celebrated with a Danish Pastry and a cup of strong tea.